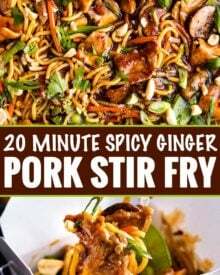 Change up your weeknight meal routine with this quick and easy garlic ginger pork stir fry! It’s a great use for pork chops and on the table in 20 minutes! Tired of the same old chicken every weeknight? 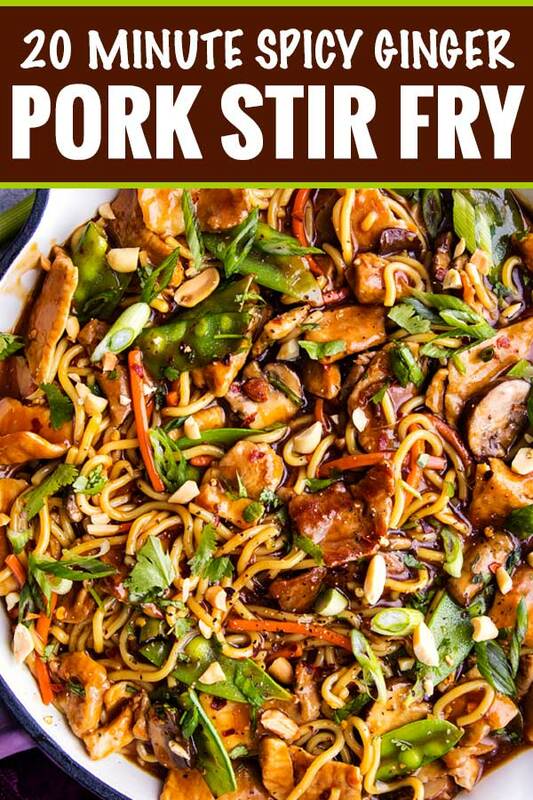 Give this pork stir fry a try! 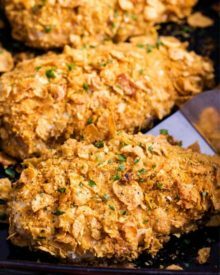 Savory, spicy (if you want – it’s customizeable), and perfectly saucy with crisp tender veggies and velvety strips of pork chops or pork tenderloin! I’ve always had a sweet spot for takeout food. Lo mein, dumplings, crab rangoons, wonton soup, you name it, I love it! But lately I’ve been making more and more takeout-style food at home, and we’re loving the results! Better quality ingredients, no msg, we control the salt amount, and bonus, no one has to drive anywhere to pick it up or pay for delivery! My newest, and possible favorite stir fry recipe to date, is this garlic ginger pork stir fry. 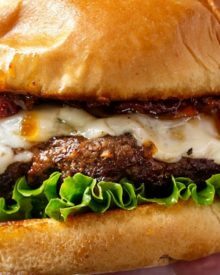 It’s savory, spicy, a little sweet, and so velvety! WHAT CAN YOU PUT IN A STIR FRY? Protein – beef, pork, chicken, shrimp, tofu, etc. Vegetables – snow peas, mushrooms, carrots, bell peppers, onions, broccoli, water chestnuts, etc. Sauce – broth, soy sauce, sometimes vinegar, sugar, and oil. Play around with added flavor by adding garlic, ginger, green onions, etc. The beauty of stir fry recipes is that they’re really a guideline, not a hard and fast recipe. You can play around with additional flavors, new veggies, a different protein (or even a mix of proteins!). Usually a stir fry is served with rice or noodles. But if you’re watching what you’re eating, two great healthy options are lettuce cups and cauliflower rice! 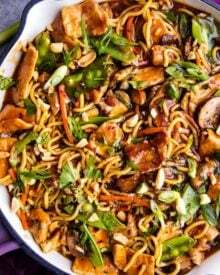 For this particular pork stir fry recipe, I chose some hokkien stir fry noodles that add amazing texture and soak up just the right amount of sauce. Because a stir fry is so quick-cooking, you want a cut of pork that’s already lean and tender. I nearly always use boneless pork chops, since my grocery store always has them at a great price, but pork tenderloin works well too. For a non-traditional, but yummy option, you can use ground pork as well. Making a stir fry is a very simple process. First, you’ll need to slice your pork thinly, and across the grain if possible. If you look closely at your pork chops, you’ll see they have faint lines running in one direction, like the grain on a piece of wood. For the most tender pieces, you’ll want to slice ACROSS that grain, not with it. Next you’ll be cooking the pork in a bit of oil over a high heat. Don’t cook it too long, or it’ll be tough. After you remove the pork slices from the pan, add a bit more oil. Cook your aromatics (like the garlic and ginger) for just a few seconds, then add the veggies until they’re tender, but still retaining their color and some crispness. Add your sauce to the pan and cook until it thickens a bit, then add your pork back in the skillet. If you’re using noodles, add them during this step and toss it all together. Slice the pork when it’s still partially frozen. This lets you get the slices super thin, with minimal effort! Prepping ahead is key for a stir fry. Stir fry’s cook SO quickly, the best thing you can do to stay stress-free is to have all the veggies chopped and sauces whisked. Use an oil with a high smoke point. Vegetable, canola, or peanut oil are my top choices. You need to have the heat cranked up in a stir fry recipe, and you don’t want to use an oil like olive oil, as it will burn. Pork and veggies can be sliced ahead of time and kept separate in airtight containers in the refrigerator. The stir fry sauce can be made ahead of time too, just don’t add the cornstarch until right before you’re ready to cook. Hokkien Noodles – seriously one of my favorite noodles to add to any stir fry! 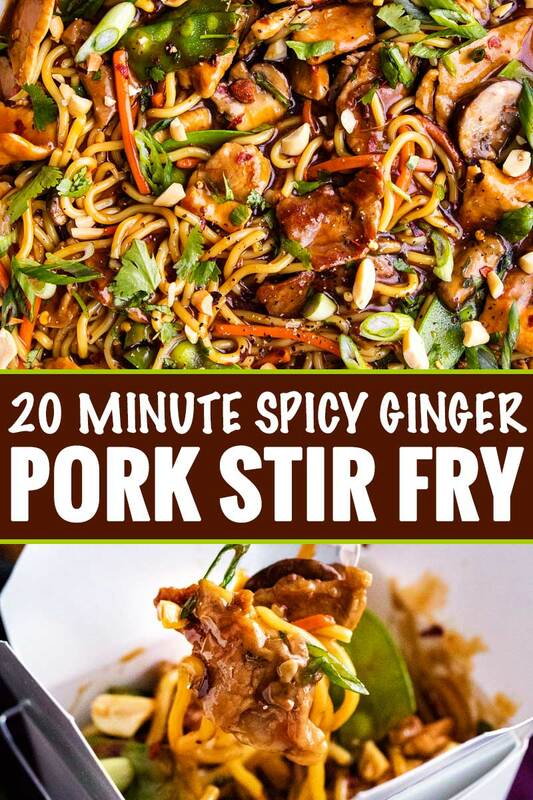 Change up your weeknight meal routine with this quick and easy garlic ginger pork stir fry! In a small bowl, combine cornstarch and broth until smooth. Stir in the soy sauces, brown sugar, sambal oelek, ginger, and red pepper flakes; set aside. In a wok or large skillet, stir-fry pork in 1 Tbsp oil over MED HIGH heat for 2-3 minutes, until browned. Remove to a plate. In the same pan, add remaining 1 Tbsp oil, garlic and ginger, cooking for 30 seconds, then add stir-fry vegetables and cook until crisp tender. Stir broth mixture and add to the vegetables. Bring to a boil; cook and stir for 1 minute or until thickened. Add stir fry noodles and pork; heat through. Drizzle with sesame oil, then top with garnishes and serve. Pork tenderloin can be substituted for the pork chops if desired. I like to add a sprinkle of black pepper before serving, but it's completely optional. This is a great way to eat in! Love it! 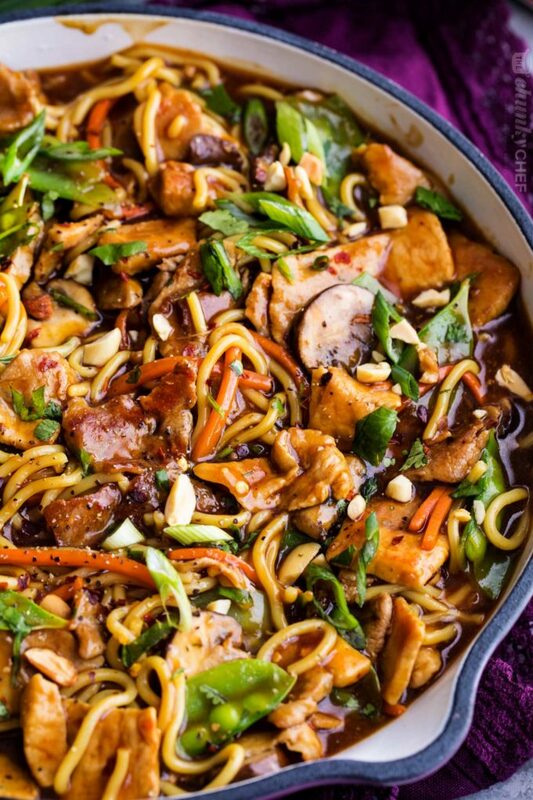 This is a great looking stir fry! I have to make it for my family asap! Looks so delish! I love this specially when we need something quick and easy, need to try this! This was a million times better than takeout!!! I love how easy it is!! I’m drooling! Dinner can’t come soon enough – I know my family will be devouring this! 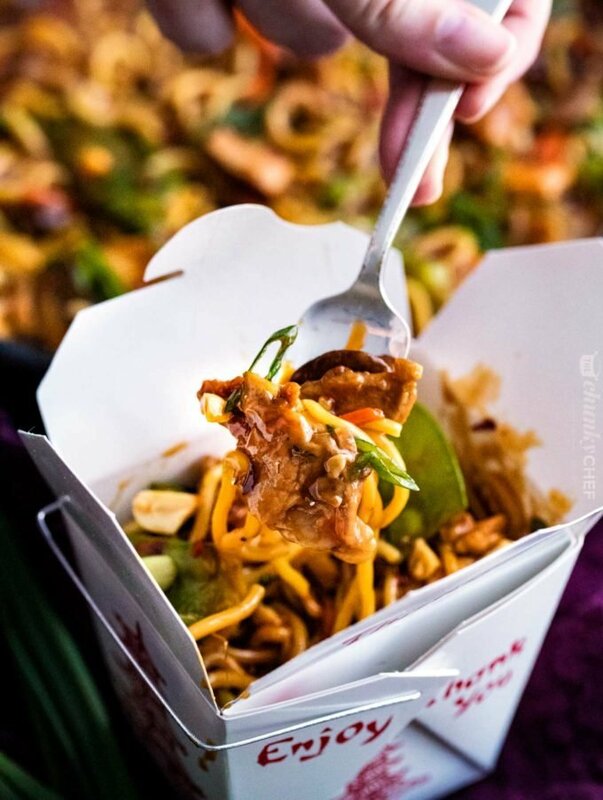 Love love love stir frys! This looks incredible. 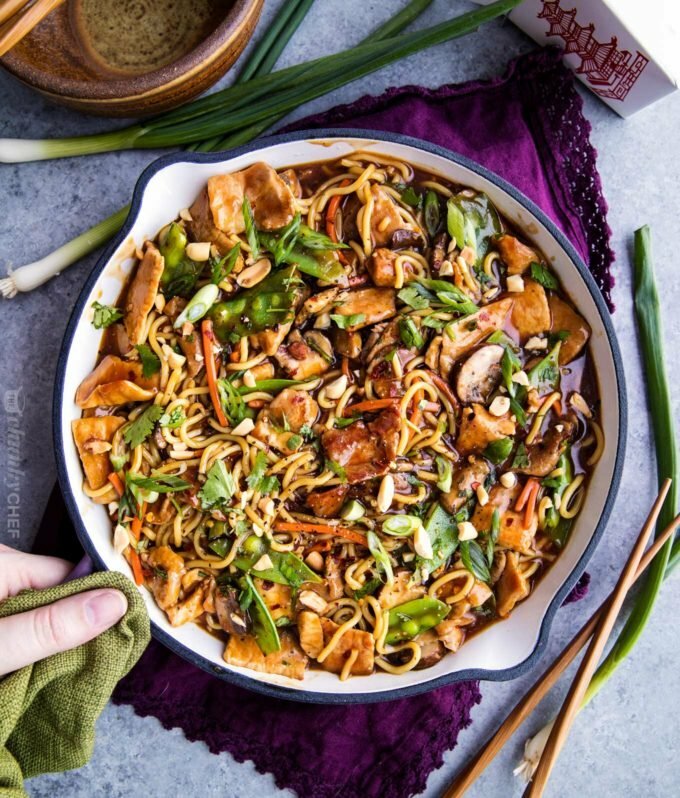 Stir fry is one of my favorite dinners to make and this recipe is one of the best! Omg! This looks so good! 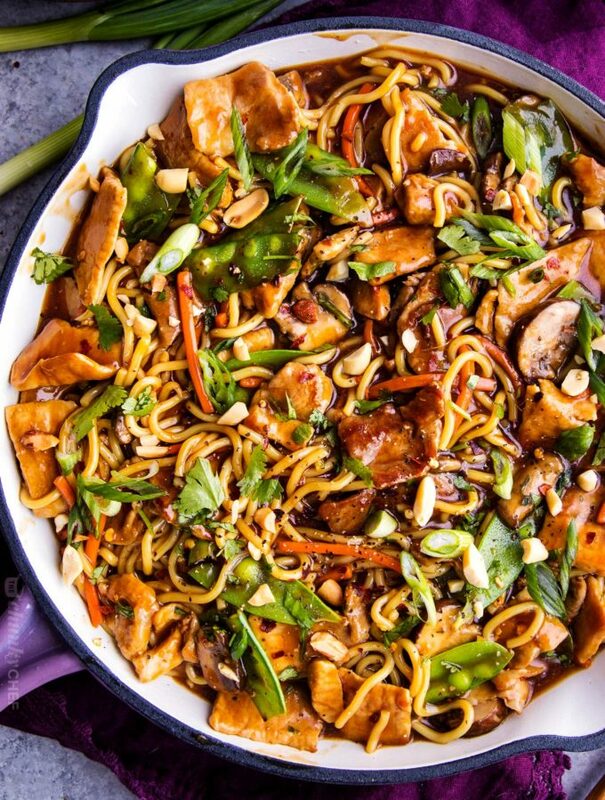 I love stir fry so I will have to get this recipe!